There are a lot of guests on this album. In fact, there are so many guests and so little Damon Albarn that you almost forget that it’s a Gorillaz album. 2010’s stoned eco-conscious Plastic Beach was an equally star-studded record featuring everyone from Snoop Dogg to Lou Reed to Bobby Womack. Seven years on, Damon Albarn has decided to try and outdo himself, returning with a party of guests large enough to make one Jay Gatsby’s shindigs look like a small turnout. The result isn’t impressive, but instead claustrophobic and messy as everyone struggles to find a place. Damon can barely get a look-in himself – it’s not until track eight ‘Charger’ that the band frontman actually manages to dominate a track and even then he’s sharing it with left-field guest Grace Jones. Clearly Damon doesn’t know what to do with this horde of guests, and so shoves guests wherever he can fit them, regardless of whether the tone of the song suits their musical style. After some slinky vocals from Kelela on ‘Submission’, the choice to have Danny Brown bulldozing in with his squawking delivery feels utterly inappropriate. And the choice to feature dark punk songstress Jehnny Beth on triumphant closer ‘We Got The Power’ is like asking Tim Burton to shoot your wedding day video. Indeed some of the guests do fit brilliantly with the beats and themes that they’re given. ‘Ascension’ is an apocalyptic twerk-anthem – not a concept you hear every day. It’s a brilliantly infectious and energetic Vince Staples song, even if it doesn’t sound at all like a Gorillaz song. Here lies the other main issue - the lack of authenticity. Much of the Gorillaz’ cartoonish individuality is lost, which is why I keep referring to Damon Albarn in this review and not his virtual character 2-D, because the cartoon guise is no-where to be seen. Humanz feels like the work of humans rather than animated weirdos, which may be intentional, but makes the album feel less wacky and fun. 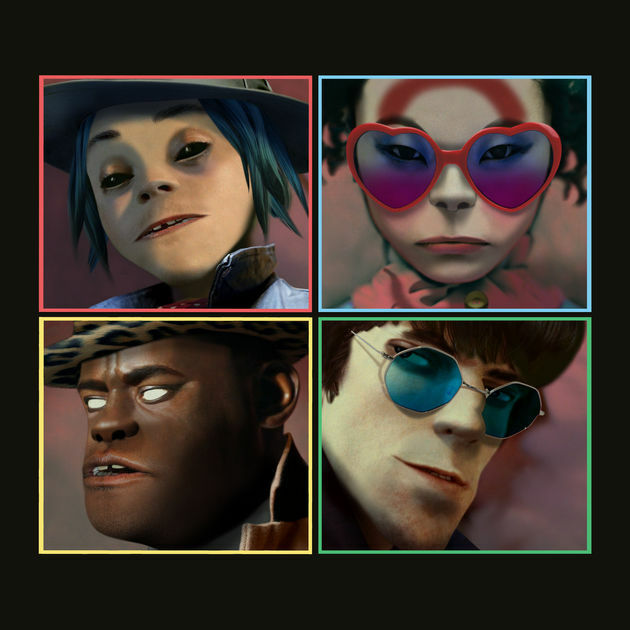 Only a handful of tracks bring back the old zany Gorillaz vibes and personally they are some of the best – namely groovy electropop jam ‘Andromeda’, quirky Brit-inflected Grace Jones collab ‘Charger’ and overblown Euro-house stomper ‘Momentz’ (which features friendly faces De La Soul). Rather frustratingly, more fun tracks of this calibre could have made the cut, but for whatever reason Damon left them off the album and reserved them as bonus tracks including synth-funk anthem ‘The Apprentice’ and playful dance track ‘Out of Body’. This only further highlights the lack of sense going into this album – why let audial atrocities like ‘We Got The Power’ slip through the net and not include gems like 'The Apprentice'? All in all, it’s a case of too many cooks spoiling the broth to the point that no-one knows what flavour broth it was supposed to be in the beginning. Moments like 'Momentz' are spicy, whilst others leave a sour taste in the mouth.